Tawdry to a fault, Pickup on South Street compared itself with The House On 92nd Street and others of a postwar realist school that Fox put signature to, but those were docu-mild beside street abstraction the notion of Sam Fuller, who knew lowlife scenes from inside out, and showed them like nobody’s past vision of urban grit. 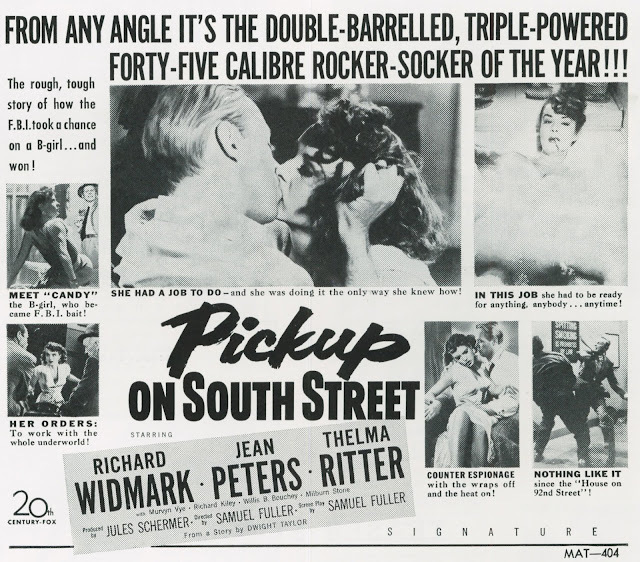 Splashy surface that was Fuller’s own was rejiggered from Hot war formula of ten years before where urban musketeers pitted Runyonesque wiles against Axis evil, and won (Bogart in All Through The Night, Alan Ladd as Lucky Jordan, others). Now they’d match street smarts with Red spies and find renewed love of country in effort to retrieve stolen microfilm. Nothing new then, but Fuller composed a dirtiest alleyway yet from staid Hollywood, Pickup on South Street inviting more than usual censor interest during and after shooting. This was a nearest thing to precode sensibility since precode was buttoned down in 1934, Richard Widmark an update on James Cagney. I can see Zanuck dictating story notes from memory of his Warner days and plugging same wires to Widmark as for JC of yore. Trouble was the yarn spun around FBI use of thieves and a “B” girl to quell espionage, the Feds dealing off bottom as readily as an underworld and Soviet plants. To put kibosh on that came J. Edgar Hoover, in person. Fuller wrote in his memoir of lunching with Hoover and Zanuck at Pickup close and the G-man’s blunt putdown not only of this movie, but the director's previous ones. We can guess that Hoover and Fuller’s perceptions of life were differing ones. 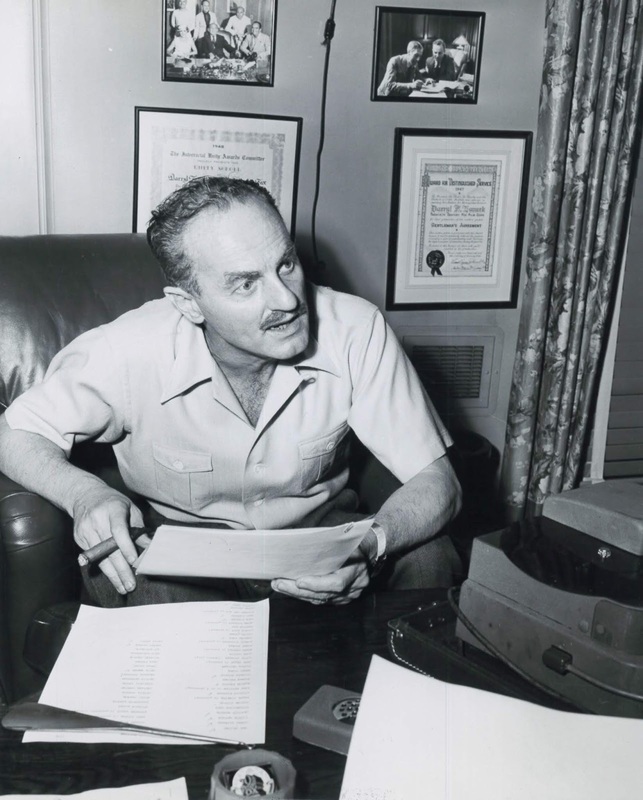 Zanuck nixed Hoover demand for changes and told the FBI chief that he just didn’t understand how movies worked, a little presumptuous as Hoover had dealt with Hollywood at least since Warners did G-Men back in 1935. Hoover didn’t keep so much a personal eye on these ventures as assign underlings to do so. If they reported a wrinkle, he’d quell it. 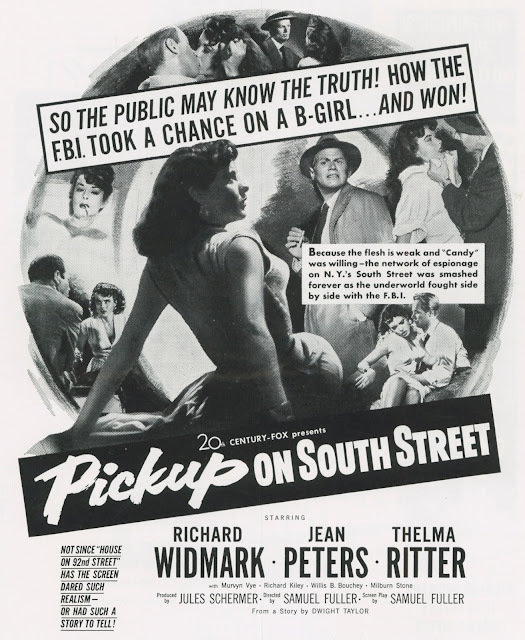 Maybe age, and focus on more vital things (like combating real Communists), kept Hoover from making a bigger issue of Pickup on South Street. Fuller framed telling in terms of Zanuck backing the Bureau chief down, but that was long after Hoover was gone and had become fair game to revisionists. 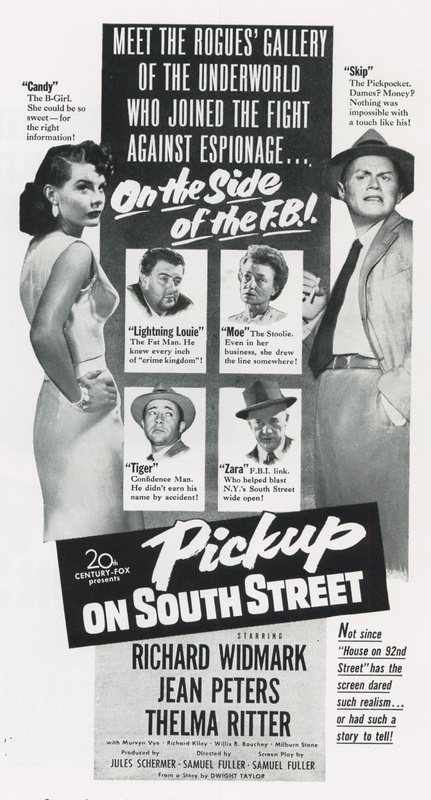 What Hoover did do was forbid mention of the FBI in all promotion for Pickup on South Street, and that meant eleventh hour revamp of Fox's whole campaign, more New York’s problem than Zanuck’s. The home office and branches had to let theatres and magazines, in fact all media, know that in no wise should ads refer to the FBI. “Very Important” said a revised pressbook cover, the accessory rendered useless to showmen because every suggested ad had reference to the Bureau. Under other circumstance, such edict might be ignored, but no showman, urban or stix-located, wanted trouble with Feds, so modify campaigns they did. A Hoover spank for inaction would have stung. Did This Man Tell J. Edgar Hoover Where To Get Off? Ads supplied by Fox were lurid as cheap paperback covers, Pickup living down to comparison with what genteel folks were used to in mainstream movies. Snip here/there and change of copy could get advertising out of harm’s way, but ads above, taken from the banned pressbook, would not show up in newspapers, unless a theatre was looking for trouble. So what was Hoover’s beef with Pickup on South Street? Mainly it was attitude of Samuel Fuller, and his film. “Skip McCoy,” as played by Richard Widmark, is a crumb who’d as soon traffic with Reds as any other lot that will pay for contraband. “Don’t wave the flag at me,” sneers Skip to cops when they explain peril to American life his conduct is causing. This deeply offended Hoover. No American could be so callous to the welfare of his country. I wonder if Fuller, or even Widmark, paid a career price for Pickup on South Street. 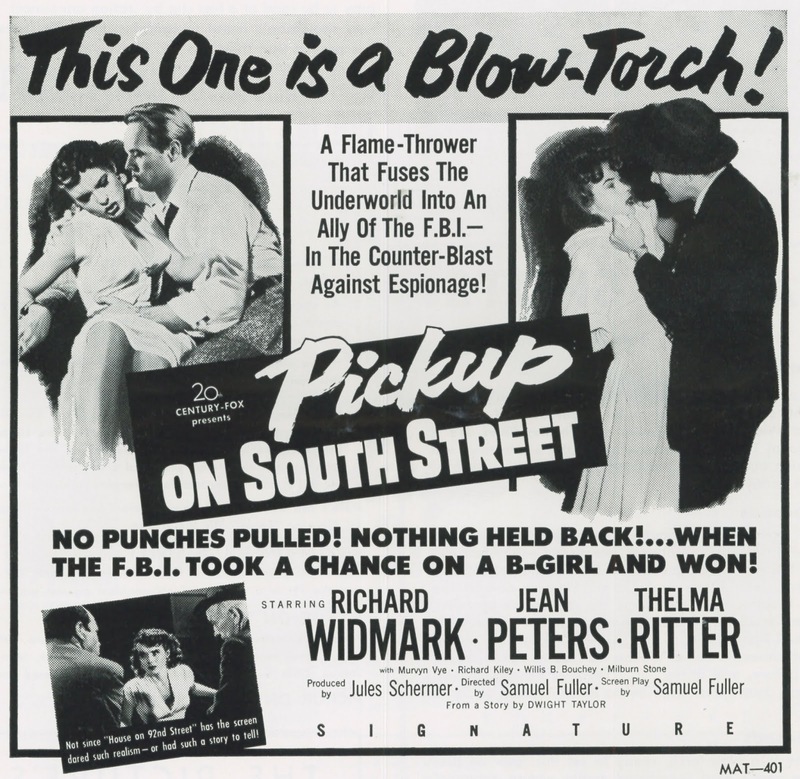 What if Widmark or his agent went after The FBI Story six years later? All aspects of that production being carefully vetted by Hoover and staff, how quick would Widmark’s name be stricken off a leading man list? 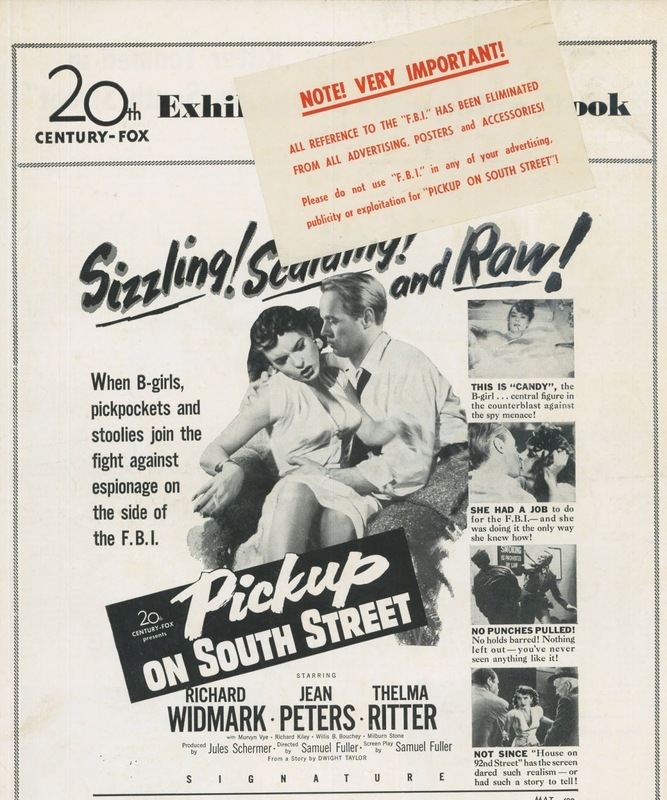 More I think about Widmark in The FBI Story, the more it appeals. He’d certainly have given more edge than James Stewart did, or could, considering heavy supervisory hand. Pickup on South Street is available on DVD, and there is a Blu-Ray from England’s “Masters Of Cinema” series, lukewarm considering the way this show ought to look, and undoubtedly did, in 1953. Stinky is willing to give credit where it is due, and Zanuck giving G-Man Hoover the what-for makes Stinky tingly all over. 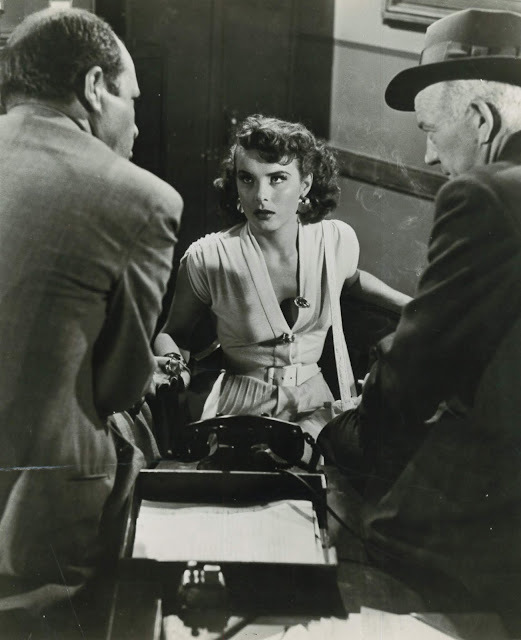 Perhaps Hoover and his sidekick Clyde Tolson also gave wardrobe pointers to Jean Peters. This may be Stinky's favorite Fuller movie. 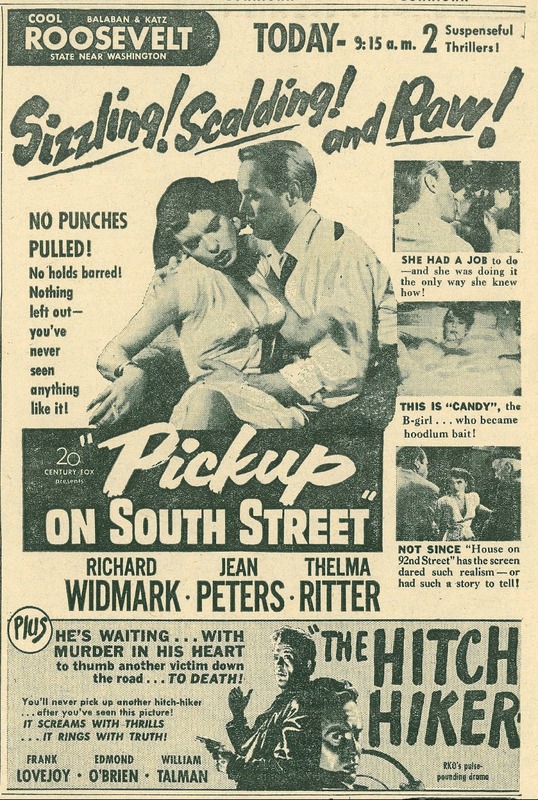 Eddie Muller showed this just last night (Jan. 27) at Noir City at the Castro in San Francisco. Played like a sonovagun to a full house of 1400. One of my favorites. Love Widmark's goofy little hide-away!